A fraction of the cost of other seed drills. 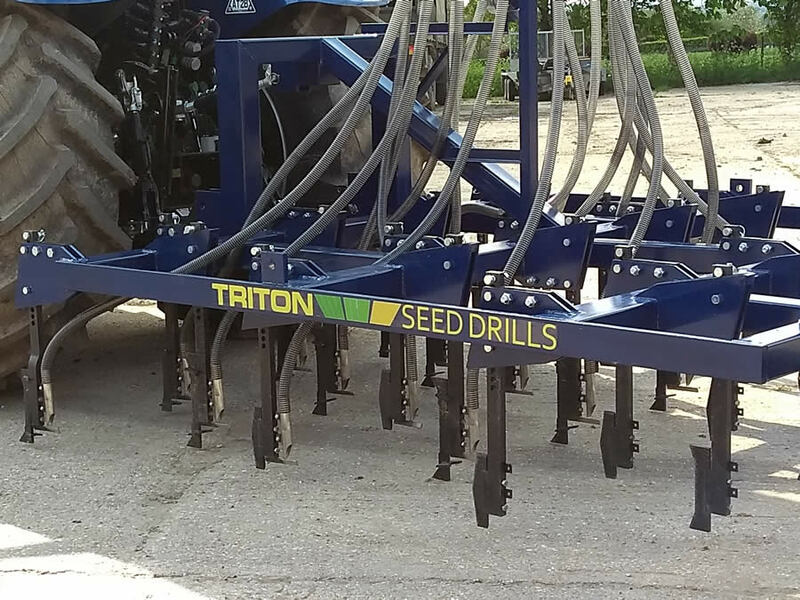 The Triton Side-Press Seed Drill is available in full draft, half draft, lite and x-lite draft setups bring the drill within the power availability of most farms. ​At just £13,950 for a 3m, all seasons seed drill excluding front seed hopper, the Triton comes to the farm at a fraction of the cost of most alternative seed drills. Triton Direct Drills are priced without the RDS GPS front-mounted seed hopper. 6m Triton Side-Press Seed Drill, excluding seed hopper – £24,950 (ex VAT). All models are rigid frame. An end tow option is available – please contact for more details. Fertiliser Applicator System – £495 (ex VAT) per drill meter. ​Triton replacement parts and spares can only be ordered direct from Triton. Triton parts can only be used on Triton manufactured seed drills. All parts and systems on Triton Side-Press Seed Drills are patent applied. Under UK and worldwide patent law ‘no crop produce can legally be used for commercial purposes if unlicensed patent designs have been used in producing the crop’.